When the 2013 NBA Playoffs began, Bulls forward Jimmy Butler had a mere four minutes of postseason experience under his belt. That changed dramatically on Saturday during Game 1 in Brooklyn when Butler started and played 39 minutes, recording 13 points on 5-of-8 shooting. 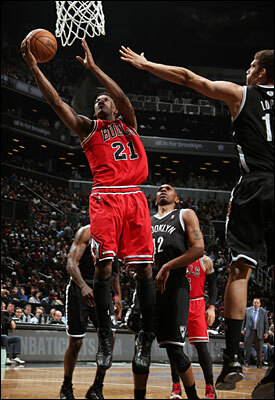 The Bulls, however, suffered a 106-89 loss which saw them trailing by 25 at the half. It’s a game that Butler and his teammates will be happy to learn from, and then promptly forget about. Given the amount of injuries Chicago has suffered this season, facing a challenge is nothing new to this Bulls team. Butler believes that because the Bulls have played short-handed on so many occasions, it prepares them to be able to bounce back in Game 2. Adjustments are often crucial in the postseason and Butler said there are several that can be made by the Bulls as they look to even their best of seven series against the Nets. Butler, who along with Nate Robinson played every game during the 2012-13 season, admits he’s come a long way from playing so sparingly in last season’s first round matchup against the Philadelphia 76ers. He was also glad to get Saturday’s Game 1, the first in which he played such a significant role during the playoffs, out of the way. That’s certainly something Butler proved he could do in the regular season. Though his opportunities off the bench were inconsistent at the start of the year, injuries afforded him a chance to crack the starting lineup in mid-January. It was a situation he took full advantage of, averaging 14.5 points, 7.1 rebounds, 2.7 assists and 1.80 steals in 20 regular season starts. Though Butler admits his remarkable progress is not lost on him, he’s more focused on the task at hand right now.